It all began in grade school when some well-meaning librarian figured me out as a sensitive kid who liked to read and handed me a copy of Bridge to Terabithia. Henceforth, that librarian will be known as the stone cold witch who killed my innocence and made me cry. At the time, I was cool with the fact that many beloved characters–Sara Crewe (A Little Princess), Little Orphan Annie, Mary Lennox (The Secret Garden)–had dead parents. First of all, we never really met the parents so their loss had little impact. Secondly, these orphans were always adopted by fantastically rich people and ended up fabulously happy. Bridge to Terabithia? Not so happy an ending. I don’t think I need a spoiler alert, but in case you still have Bridge to Terabithia on your Goodreads “want to read” shelf, then stop here and go get it already. It was published in 1977 so you’ve had ample time. I am one of those people who do not remember much from childhood, but I specifically remember reading this book, sobbing uncontrollably, and wondering why, oh why, this stone cold witch who killed my innocence and made me cry thought I should be exposed to such tragedy. Didn’t she know I would be destroyed when Leslie, the young female protagonist, died in a senseless accident? Now, as a librarian myself, I understand that she read the book, recognized its greatness, and wanted to share it with someone. When I think about it that way, it is actually kind of flattering that she wanted to share it with me…or would be if she hadn’t shattered my innocence and crushed my heart. You know a book is powerful if you still remember the story–and your visceral reaction to it–thirty-five years later. I’m still blubbering over great books, probably more than usual lately. Typically, it isn’t over a character’s death. In fact, I recently read a book where the main character’s best friend committed suicide, but I wasn’t emotionally invested enough to have much of a reaction. Yet, in the following books, I went totally Terabithia. Great writing does that to me. 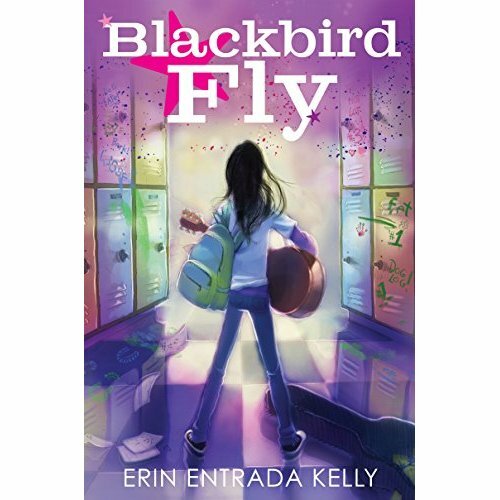 Blackbird Fly by Erin Entrada Kelly – I randomly checked this book out of the public library because l loved the cover and the jacket copy. It turned out to be one of the best coming-of-age books I have ever read. Apple Yengko is a badass. She is the only Filipino girl at her school, longs to play guitar like George Harrison, and has just found out she is on the Dog Log at her school. As someone who was called a “dog” in junior high by a boy I liked (Or maybe by his best friend? I can’t remember. I told you my memory is bad.) I related to Apple’s situation. Boys can be cruel. Girls can be worse. Those who survive middle school are warriors, and Apple…she really rises above. After reading this book I almost wanted to go back to junior high and have a do-over. Almost.